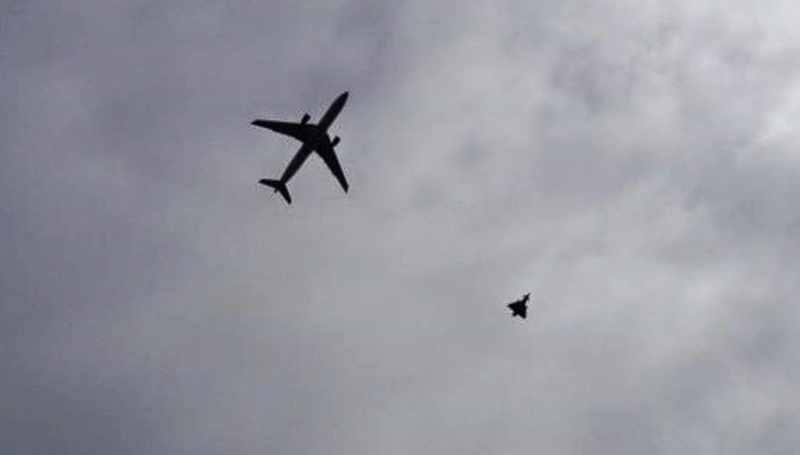 Police arrest a man on suspicion of making a hoax bomb threat after a plane is escorted to Manchester Airport by RAF fighter jets. A passenger plane was into Manchester Airport by an RAF fighter jet after the pilot reported concerns about a possible device. The emergency came when the pilot of Qatar Airways flight QR23 from Doha to Manchester reported concerns about a possible device. It landed safely. Eye witness Paul Bell, who is heading for a holiday flight due to leave from the airport's Terminal 1, told Sky News his family saw the drama unfold as they were heading to the airport. "We heard the fighter jet circling over Stockport and about 10 minutes later we saw the aircraft coming in. "It was literally looping round the aeroplane." He said the airport was now on "lockdown" and he was stuck in a traffic jam at the airport. It is thought that parts of the airport have been evacuated and most incoming flights have been diverted to Leeds-Bradford and other airports. An RAF spokesman said: "We can confirm that Typhoon aircraft were launched from RAF Coningsby in their quick reaction alert role this afternoon to investigate a civilian aircraft whose pilot had requested assistance."